Between the harsh, angular look of the building and the gritty black and white processing, I too think of some sort of dystopian, film-noir future when I look at this picture. Hmmm.. That looks like a futuristic palace of the Overlords-that-be! And then I read that it was a Public Library! Ha Ha, The books are out to get you! Wonderful, this makes a dramatic and compelling image. Thank you Graham, glad you liked it. 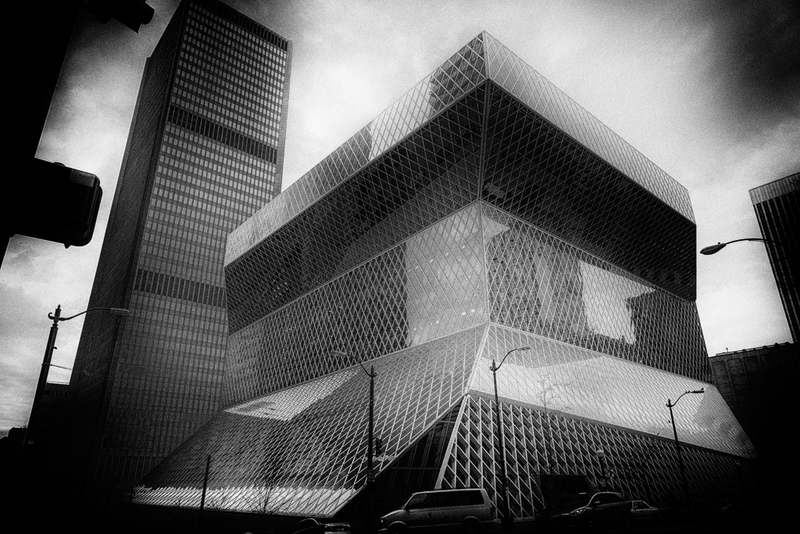 Yes, the Seattle Public Library is certainly a wonderful building. Thank you for the comment. You are welcome and thank you for the wonderful comment Erika! Very futuristic. Reminds me of computer game I played in the 90s called Syndicate, which was set in a gloomy futuristic dystopia (heavily inspired by the film Blade Runner). Anyway, nice work.